The RD3U is part of Hydra family. 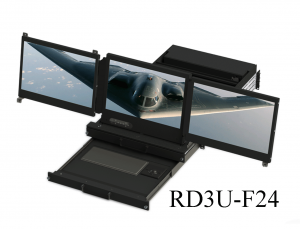 Both the RD3U-F20 and RD3U-F24 can provide up to three displays. Along with the multiple display options there is an integrated keyboard drawer. In addition with its gas shock stabilizers, telescoping mounting arms, steel friction slides, and modular design. 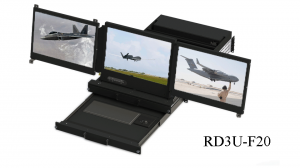 The RD3U can be easily configured for use in the most mobile or transit case applications. The RD3U-F20 is a rugged Multi-Head 3U 20” depth platform which can provide up to three 17” Wide 1920×1200 (WUXGA) LED backlit displays, and an integrated keyboard drawer while taking up only a minimal rack footprint. In addition, with it’s gas shock stabilizers, telescoping mounting arms, steel friction slides, and modular design, the RD3U-F20 can be easily configured for use in most mobile or transit case applications. The RD3U-F24 is a rugged 3U 24” depth Multi-Head platform which can support up to two 19” 1280×1024 (SXGA) or three 17” Wide 1920×1200 (WUXGA) LED backlit displays, and an integrated keyboard drawer. This 24” platform allows for a higher degree of customization by providing more room for alternate controllers/inputs or custom electronics. With it’s gas shock stabilizers, telescoping arms, friction slides, and modular design, the RD3U-F24 is ready for mobile or transit case applications.